I knew that “What was your first designer toy?” would most likely be asked of me. Or, at least, some variant on it, like “How did you get into designer toys?” So, to quell my nerves, I practiced an answer for that one question, rehearsing the reply silently to myself over and over again. Of course, once you — as a guest — are emersed in the off-the-cuff, conversational nature of the Marsham Toy Hour then all of your prepared thoughts become fleeting, like faded memories that you can’t properly recall. Thus I present my full and proper answer, as weird and meandering a tale as it is. Giving a backward glance at my own childhood, I can’t help but refer to the late ’70s and early ’80s as being a heyday for toys. And while I loved all my various plastic playthings at the time, they slowly lost their appeal. My Luke Skywalker and Darth Vader action figures lay dormant on the floor, their telescoping lightsabers no longer clashing. Bygone were the days that the forces of Cobra plotted dastardly deeds from their cardboard home base, so the idea of Real American Heroes to thwart them became defunct. Adolescence was upon me, and with it, these toys and many others were unceremoniously dumped into an unlabeled box, eventually given to a new generation to enjoy. For years after that, the only thing I was interested in collecting was vinyl records, the grooved surfaces emitting music that I could become lost in for hours. But, as is typical, my college years brought about exposure to various “new” passions, including musical genres I’d previously dismissed, novels I’d never heard of, and the resurgence of toy-like forms into my life as collectibles. No longer meant to be child’s playthings, these statue-like pieces had no articulating arms and legs, they simply delivered depictions of characters my young adult-aged brain enjoyed, repackaging them in a form that I could proudly place on my desk. Like the above-pictured pieces from 1999, I acquired quite a few based on Devilman, a Japanese anime that I’d stumbled across videotapes of. And it was collectibles like these that, in a sense, primed me for being able to evolve into designer toys, along with how Yoshitaka Amano‘s Hero exhibition prepared me to consider designer toys as art (learn more here). Late in 1996, the album Endtroducing….. by Josh Davis’ DJ Shadow alias was released, it being a revelation to me with its countless samples blended into an instrumental score with a hip hop beat. I immediately sought out everything I could from this musician, journeying down an aural rabbit hole that led me to explore other LP releases on Mo’ Wax Recordings, the label that took a chance on the unknown DJ Shadow. And I had no clue that this venture would result in my first exposure to a designer toy. In 1997, Mo’Wax partnered with a Japanese brand, A Bathing Ape (or BAPE), to issue the double length compilation Ape vs. Mo’Wax. 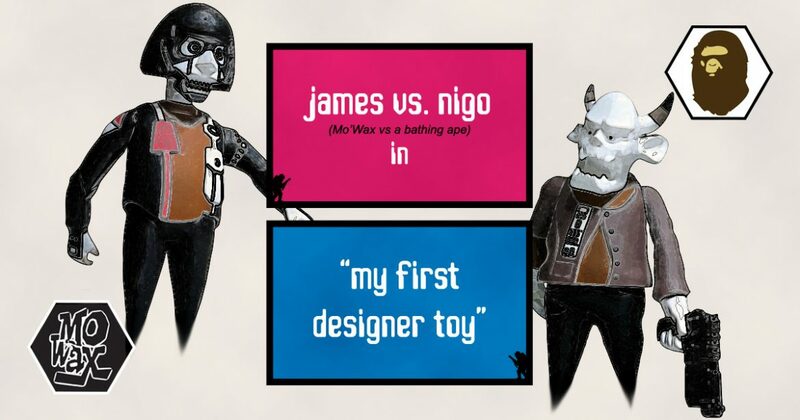 And, to promote this, the graffiti artist Futura (Leonard McGurr) reimagined the founders and owners of these two brands, James Lavelle and Nigo (Tomoaki Nagao), in vinyl figure form. At the time, I thought of these as nothing more than another cool collectible, but looking back now I’ve come to realize how these stylized sculptures were designer toys, their urbanized interpretations having been infused with Futura’s aesthetic and “soul”. Unfortunately, the James vs. Nigo set has eluded me all these years. In fact, it wouldn’t be until 2002 that I acquired my first piece that one could accurately call a designer toy. But regardless of what they were referred to at the time, I have trouble viewing all three of the above as true designer toy works. For instance, the KAWS based one, the two figure KAWS-Kubrick 2 set with bus stop display, is too hampered by the corporate art form of Medicom Toy‘s Kubrick, the art feeling forced onto the shape. And Chris Ware‘s Jimmy Corrigan: The Saddest Toy in the World is a wonderful 3D interpretation of the indie comic character, as produced by Presspop, but it doesn’t feel like the artist’s work, especially when compared to 2005’s Quimby the Mouse, which perfectly embodies Ware’s aesthetic. But the final piece, Pushead‘s Mecha-Terror: Devilman windup figure, is undeniably a designer toy to me. It might use the concept of Devilman as a basis, but instead of attempting to accurately depict creator Go Nagai‘s vision it is a complete reimagining by Brian Schroeder using his Pushead alias. And it seems strangely appropriate for my first true designer toy to be Devilman based, an enduring reminder of my journey from collectibles to art toy pieces.